I have been extremely busy the past few weeks. I am currently on secondment as a manager for my store where I work (usually part time), which has been exhausting. Who knew there were so many health & safety regulations?! In between that, I have been working with My First Job in Film (who ran the Video CV competition that I won a couple of weeks back) in getting my Cover Letter and CV up to scratch, as well as creating a plan for starting my career in film. So a lot going on and not enough time to blog! However… I went to see Dredd 3D last night. Let’s put it this way, I’m taking a quick break out of my scarily busy schedule to write about it. That’s something I didn’t even do for The Dark Knight Rises! I love Judge Dredd. He is the relentless anti hero with only one thing on his agenda: upholding the law. In fact, he IS the law! I first got into Judge Dredd when Sylvester Stallone’s movie adaptation was released in 1995. I loved the film – don’t judge me (excuse the pun) – I was only 6 years old! I got the Sega Mega Drive game and started collecting the art cards and pogs, all of which I still have! It was through them that I realised that Judge Dredd was actually a comic book character under the British comic publisher 2000AD (who, I am proud to say, I had an interview with earlier this year). The villains or perps are one of a kind and I love the artwork and the whole concept in general. I was humbled to have met Brian Bolland (one of artists who worked on Judge Dredd and designed the Dark Judges) when I was at university. I also got him to sign my copy of ‘The Killing Joke’, which he also illustrated. So when I found out a few years back that a Dredd film was in the planning stages for another movie adaptation, I was a little more than sceptical! Suffice to say, after what I saw last night, I needn’t had been worried at all! The film was fantastic! There was so much true-to-the-comic violence. Not just any violence; super slow motion, highly detailed, omg-this-is-so-damn-awesome violence. The visual effects were some of the best I have ever seen with some stunning stylisation, especially during the slo-mo narcotics scenes. It was dark and gritty. The music and sound design made my hairs stand on end. 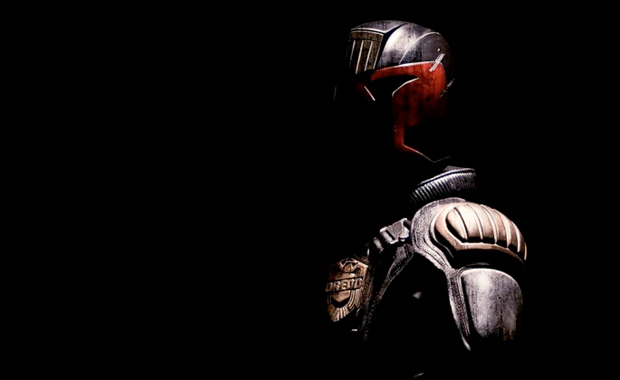 The use of 3D was THE best usage I have ever seen in a film and most importantly, Judge Dredd did not once take off his helmet; just as it should be. Overall, if your mind even flickers to think ‘I might go see this’, just do it and you can thank me later. It hasn’t got the most in depth, Oscar-winning storyline, but it is a fun, action packed, best of British (yes, it’s BRITISH!) movie that you would have to be an absolute moron to not go and see! I loved this film way more than The Dark Knight Rises and I adore Batman.